If you have a big event - we are indispensible. We will find out what you like in general, suggest something that will look good, create the best decorations possible, plus we would suggest you the best vender for any need you can possibly have for your party or after. But.. what if you have a small party? What if you have a small room? At home, in a small community room, for a small group of guests and on a small budget? And, to make it even more interesting, on a very short notice. Can we be of help to you? Yes, we want to help and we can help! There is no theory, it will be given to you in a form of a lot of tips and suggestions. All these tips are for the people that never decorated anything, do not know where to buy anything for the party and are not very good with their hands. However, we do believe that, even all of it is very simple, our experience will be helpful even to the weathered professionals. On the other hand, it is not only the way to dress up the room in the most economical way. In my opinion this is secondary. This can be a project that you can do together with kids or even with adults. As it is in many other situations, creating is more fun than using! I have a relatively small room and I want to use balloons for decorations. This is the basic block. There is a number of way to attach it around the room (see next tip). Obviously you can use up to four colors, or even more - in other clusters. It depends on the theme. If it is the third birthday and you do not have any particular color theme in mind - the more - the better. If you have a theme - we recommend no more than three colors. 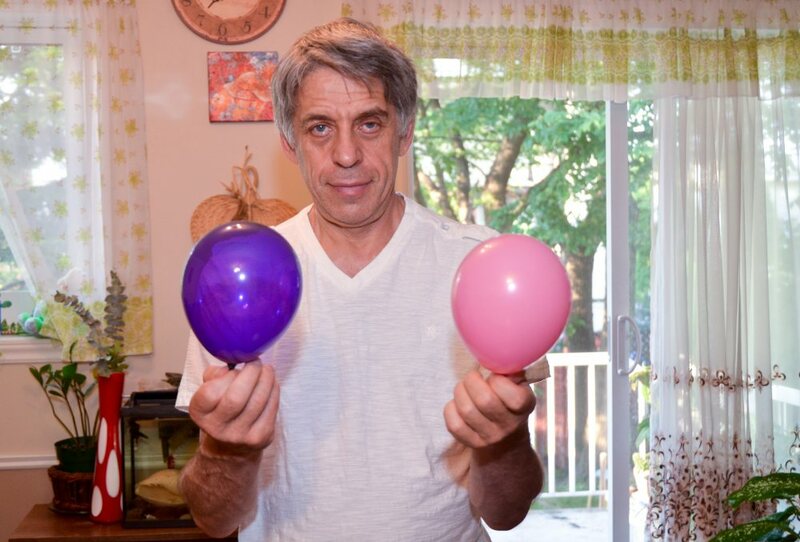 Do you have to stick to the 5" and 9" balloons only? No. You can use the long balloons that are used by twisters. Make the most fantastic shape and put it on the wall or suspend from a chandelier on the ceiling ! Also you can suspend a cluster like that on a ribbon from the ceiling down (if you have anything to attach the ribbon to, chandelier for example). 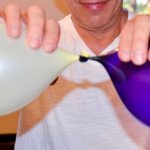 Yes, you can suspend one balloon, but it looks droopy - like a helium balloons that used to be flying, but not any more... Cluster does not look droopy, even though it is filled with air. If you want to have it round - make a double cluster. 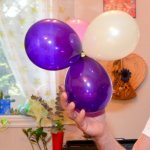 For that take two regular clusters and twist them together, so that you have 8 balloons "growing" from the same point (see the picture). 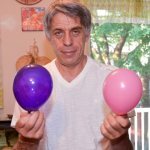 One more thing about the air filled balloons. Inside the house they last for a very long time. So if you want to enjoy results of your decorations, balloons will be there in good shape for couple of days for sure. They will not deflate for another two weeks, but they will lose the shine. You can attach it to the chandelier on the ceiling or on the wall, to the curtain rod, to the handles of the closet or door. Look around and you will find a lot of opportunities. 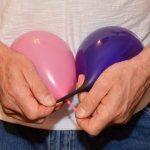 The right way (which means - the quickest) is to do that is to wrap the necks of the balloons in the cluster around something. 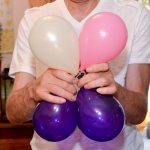 If you can not wrap the balloons around something, you can tie them with a ribbon and make it a part of the decoration. Do not forget to curl it! But, if you want to decorate the ceiling and there is nothing to attach to? Paper masking tape is the answer. Cheep, widely available, leaves no marks on the walls and ceiling. Make a piece of tape into a loop (so that the sticky side is outside), stick the tape to the ceiling, and the cluster to the tape. All kind of tape is available, but all "good" (those that sticks well) leave marks on the surface or take the paint off when you remove them. But, if for some reason, you have a wall covered with ceramic tile - use regular double sided tape or whatever you have at hand. Stick a few balloon clusters around the ceiling, make sure you cover the corners, that makes the room "looks" bigger.